When my Delacorte editor heard I was working on a book set in Central America, she gave me a copy of Red Glass by fellow Delacorte author Laura Resau. I'm so glad she did. Red Glass is the story of 16-year-old Sophie, whose family takes in 6-year-old Pablo, the lone survivor of a group of illegal immigrants who died crossing the Arizona desert from Mexico. When they discover Pablo's extended family is still alive, Sophie travels from Tuscon to Mexico and Guatemala with four diverse companions. Adventure, danger, and enlightenment ensue -- and also, love. Red Glass stole my heart, not only because of its setting, but because of its story, its characters -- especially Dika, Sophie's Bosnian refugee aunt -- its romance (you'll fall in love with Angel, I promise), and most of all, its language. Laura steeps her descriptions of Mexico and Guatemala in sheer beauty, resulting in a book filled with gasps and sighs. You know a book's a winner when it's packed with lyrical language, and yet, pulls you from page to page to page. It also takes a controversial topic -- illegal immigration -- and brings to light its heartbreaking human condition elements by focusing on a simple story. I can't wait to read the rest of Laura's books. After college, you taught in a tiny village in Mexico's Oaxaca region. Your time there inspired several of your books, including Red Glass and What the Moon Saw. Were the stories percolating in your head during your stay? When and how did they come to you? I was constantly writing in notebooks during my time in Oaxaca, jotting down notes about fascinating people I met, stories they told me, zany experiences I had. I also loved just capturing sensual setting details— wood smoke-filled adobe kitchens, third-class buses blasting cumbia tunes, remote cloud forests where medicinal herbs grow… During my first two years living in Oaxaca, in addition to my journaling, I wrote short creative non-fiction and stories, without focusing on any long projects. This laid the groundwork for What the Moon Saw, which I began writing the following year in grad school in Tucson. Maybe it was my way of staying close to Oaxaca in spirit-- I missed it terribly! When I returned to Oaxaca a year later to do cultural anthropology fieldwork in Mixtec villages, I spent my spare time completing a solid draft of the novel. I wrote my second book, Red Glass, while living in Colorado, but I drew on much of the material I'd written in my notebooks in Oaxaca years earlier. You carry notebooks with you everywhere. How do they facilitate your writing process? Writing in my notebooks gets me in the habit of quickly transforming my thoughts and feelings into words on paper. It's so important to master this skill, because once you're in the midst of creating a novel, you're juggling so much more that just the writing part of it. You're working intimately with characters, plots, settings, relationships… and you can only hope that the actual writing comes naturally after so much practice. The notebooks also give me a place to process my day-to-day emotions, record ideas and bits of stories-in-progress, and reflect on how my current manuscript is coming along. And as I mentioned, when you're traveling, notebooks are a great place to jot down impressions and observations and dialogue that you might use in a story someday —maybe even years later. You're fluent in Spanish, and you've also learned some of Mexico's indigenous Mixtec language. What are a few of your favorite words or sayings? I really like the expression "We all eat from the same tortilla," which appears in What the Moon Saw. I always love thinking about my friend Doña Epi chasing chickens from her adobe kitchen with a broom, and shouting, shraandaa pendejo! This is a mix of Spanish and Mazateco and means "Damn chickens!" In Red Glass, you achieve what I thought was a perfect balance between the beauty and the ruthlessness of its impoverished Latin American setting. Was it challenge keeping your descriptions honest? Thank you! What a great question. In the early stages of writing the book, I didn't even think twice about portraying Latin America with a mix of beauty, poverty, and brutality. This portrayal reflected what I'd witnessed in my time living and traveling in the region. The stories of the immigrants in Red Glass were inspired by my immigrant friends' own stories—the gang violence on the Guatemalan border, the political violence in Mayan regions of Guatemala in the eighties, the scary trial of crossing the Sonoran desert as an undocumented migrant. Later, during the revision process, my mother (who'd spent time doing Habitat for Humanity in rural Guatemala) pointed out that readers unfamiliar with Guatemala might get the impression that the whole country is a dangerous place. As a result, I included some lines (from Rodrigo) about how more touristy areas like Antigua and the Mayan ruins are beautiful and safe. That got me thinking about my responsibilities as a writer for young people-- responsibilities I didn't give too much thought to before my books were published. It wasn't until after Red Glass was published that my husband and I decided to adopt a baby from Guatemala. Now our son is three (and has been with us for over two years), and I do sometimes wonder what he'll think of Red Glass when he reads it in a decade. Now I have the new perspective of seeing the book from a mother's point of view, wondering how my Guatemalan-born son will respond to it. During our adoption training workshops, there was an emphasis on educating our children about their cultural roots. I think it's important to show my son the incredible beauty of the country where he was born, while being honest (when he's ready), about the history of violence there. Is Pablo—Sophie's "Principito"—inspired by anyone in particular? He's probably one of the only main characters in the story who wasn't initially inspired by a particular person. Although I know children who have illegally crossed the border at Pablo's age, thankfully none of them went through the tragedy of seeing their parents die on the journey. When I was living in Tucson, just an hour's drive from the border, I felt deeply affected whenever I read in the paper about migrants who died crossing the border… it was happening so close to my own back yard. Like Sophie, when I went on hikes in the desert (which can reach 115 degrees! ), I thought of the migrants who might be crossing at that moment. As far as details of Pablo's personality and appearance, I gathered ideas from a number of young Mexican friends whose lives have been impacted by immigration. Many of them haven't seen their fathers (and in some cases, mothers) for years, since they're working in the U.S. Although these children's parents are alive, they still have to deal with the deep sense of loss and sadness that comes with being separated from their parents for years on end. Your book, The Indigo Notebook, takes place in the Ecuadorean Andes. Its sequel, The Ruby Notebook, takes place in France. How do you tackle researching an international setting, both from home and abroad? Where are you traveling next? What's on your future travel wish list? I hope to go to Mazunte, Oaxaca this summer to finish up The Jade Notebook research (I really want to witness the sea turtles coming ashore to lay their eggs at night!) This winter we're planning a family trip to Guatemala—probably to the Lago Atitlan area—a beautiful lake surrounded by Mayan villages. The following year, I want to go to southeast Asia—Bali, Laos, Thailand, Bhutan… I've been dying to go ever since I studied the cultures of these regions in my anthropology classes. I'm going over page proofs for The Ruby Notebook which comes out in September. I'm also about to go over copy-edits for The Queen of Water, a novel based on a true story, which I co-wrote with my good friend María Virginia Farinango, a Quichua woman from the Ecuadoran Andes who had an amazing and inspiring girlhood (available Spring 2011). I'm trying to find time to write The Jade Notebook… not an easy task! What are some of your favorite writing tips for aspiring authors? Let go of self-doubt. Love the process. Set small and large goals for yourself. Join a writers' group (who will hold you to those goals). Don’t be a perfectionist (well, not until the final stages of your manuscript). Make sure you're actually writing every day. Write about your work-in-progress in your journal as you're writing it. Make writing a priority—set aside regular time for it. Disconnect from the Internet during your writing time. 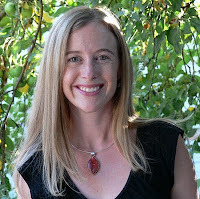 Treat writing as a sacred and joyful act! Thanks for a fantastic interview, Kirsten! It's been lovely! Visit Laura's website at www.lauraresau.com. "Let go of self-doubt." How poignant! Hi Kirsten (and Laura), great interview. 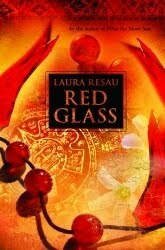 I look forward to picking up a copy of Red Glass. It sounds like a beautiful setting. I found your blog from a comment you posted over at Elana Johnson's so I thought I would stop by, comment and follow. Please feel free to visit mine and do the same. Amazing! I really want to read this book now. "Let go of self doubt. Love the process." Travel is such a creative motivator, and I love how Laura used the settings she lived and breathed in her fiction. Can't wait to check these books out! Sometimes loving the process is the hardest, hardest part. Great advice. I had Red Glass on my to-read list, but now I'm adding the others. :) Thanks for the interview! Really enjoying everyone's comments-- thanks so much! I already commented but I had to come back to say thanks for the follow! I loved this interview, especially the part about how Laura writes in her notebooks. I really want to start doing that!! I am a Laura Resau fan thanks to Gae, our fabulous YA book buyer, at SC Bookshop. She promised me I would fall in love with Sophie and Prinicpito in The Red Glass. I did. 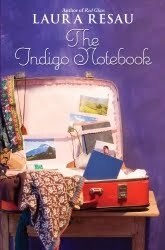 Am now reading Indigo Notebook and can't put it down. Thanks for taking her out on a spin on your fabuloso highway! Authors who inspire teens to get out and see the world are crucial, I think, and one who writes as beautifully as Laura is a godsend.